ONLY Winners Take the Challenge from the TOP Italian Olympic Gold Medalist, National Level Coaches and Top Notch Fencers in Jesi, Italy this Summer! ONLY Accepting the Top Fencers Across the World! Pre-Register NOW for FREE with STEPIO before it is full house! Before joining the famous Jesi Camp this July, Coach Aspromonte designs a tougher, more focussed, more winner-oriented special challenge camp for 5 days. Yes ... DO NOT TAKE THE CHALLENGE IF YOU ARE NOT THE WINNER! The Jesi Camp is the best in Italy, and this Special Challenge Camp is THE BEST OF THE BEST! 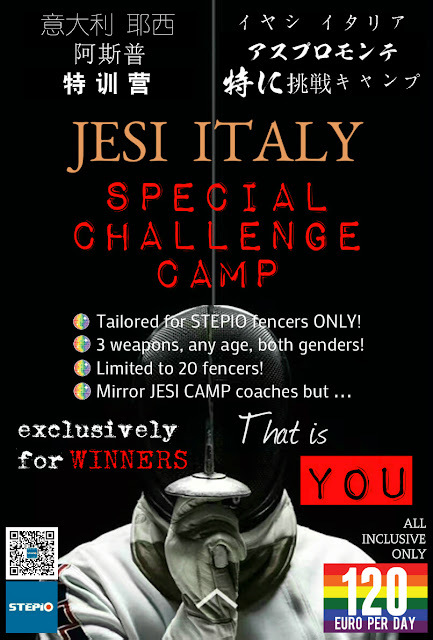 You will be challenged by the coach team same as Jesi Camp (if not more), in an enclosed venue and offered specialty training with the best, high selected fencers in 5 days, prior to the Jesi Camp. The training program is still a secret and reveal to the fencers in the Special Challenge Camp ONLY. You still enjoy the same hotel, same food, same weather as in the Jesi Camp, yet you have weapon-to-weapon contacts with all coaches EVERY MOMENT in the Special Challenge Camp. Duration : 5-Day total; 25-29 July. Venue : Club Scherma Jesi, Jesi, Italy. Purpose : Enhanced training program for the best fencers prior to joining the Jesi Camp. Coach : Olympic and World Champions - Stefano Cerioni, Giovanna Trillini, Valentina Vezzali, Elisa Di Francisca, Rossella Flamingo. Weapon : Foil, Epee and Saber. Gender : Male and female. Age Limit : Age of 8 or above. Group : Athletes will be divided based on age and technical abilities. Camp Fee : EUR600 per athlete, including hotel accommodation, buffet meals at hotel and shuttle bus transfer to and from hotel and venue. Hotel : 5-night included; Hotel Federico II or Hotel of Nani; twin bedded or triple or quadruple standard room. EUR70 per 30-minute lesson, with your selected Coach; reserve with STEPIO earlier once completing pre-registration; subject to in-advance booking and availability. Not included; expenses related to airfare, dining-out, private gathering among athletes, local transports and suveniors are NOT included. Don't forget you can always get special gifts from coaches they brought from their countries if you perform well in camp! Public indemnity insurance is managed for the event; foreign fencers to manage their own insurances. Accompanied STEPIO Coach : STEPIO arranges accompanied coach with the athletes who register with STEPIO from Hong Kong, Macao, Korea, Singapore, Taipei, Taichung and Moscow. It is USD60 per day EXTRA to the Camp Fee.